Chinese PC and data center server provider Lenovo registered its second consecutive profitable quarter, announcing $11.91 billion in revenue for the first quarter of the financial year ending on June 30th, a 19 percent increase year-on-year. The company’s net profit of $77 million was supported by growth in its personal computer business, which leapt up by 11 percent, which has been attributed to two causal factors: the introduction of Windows 10 OS and the ensuing systems replacement by enterprise customers, and Lenovo’s acquisition of a 51 percent stake in Fujitsu’s PC and laptop business earlier this year. A share of the company’s profit recovery came from $105 million in cost savings in its mobile business, and another $73.9 million of unspecified cost savings. Despite releasing a new mobile portfolio, the segment still failed to bring in a profit. This also applies to its data center business. Although the company registered $1.6bn in revenue for the division - a 67.8 percent increase year-on-year and an all-time high - and profitability rose by 11 percent, the segment still made a $63 million loss pre-tax. The biggest revenue sources in the division were its ‘ThinkAgile’ converged systems - and namely its CP series, a fully integrated cloud infrastructure, SDN and automated compute and storage platform accessible via a software-as-a-service portal - as well as HPC, AI and hyperscale products. And indeed, the ThinkAgile brand has more than doubled year-on-year; the company became the number one high performance computing (HPC) provider on the Top500 supercomputing list this quarter, overtaking HPE with 117 systems; its hyperscale server business more than doubled and its flash storage systems sales grew by 42 percent year-on-year. In an earnings call (via Seeking Alpha), the company’s President and CEO Yang Yuanqing said the company is planning to develop its network functions virtualization (NFV) and edge computing product range, as well as make continued investments in software-defined infrastructure, artificial intelligence, storage and networking. The company’s EVP, Wai Ming, said he was “confident” that the division would remain sustainably profitable. 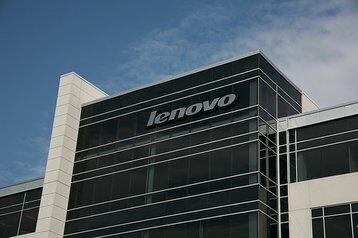 Lenovo became a major data center player in 2014 when it bought IBM’s x86 server business, but has struggled to keep the division afloat, which some have said could be due to stagnating data center hardware sales, the lack of a clear strategy for the business, or a tendency for customers to lack trust in Chinese manufacturing processes. The company has doubled down on its data center product portfolio and increased investment in sales and channel partner programs in the past eighteen months, which may take time to bear fruits.